Leonard Stamm has extensive experience (almost 30 years) representing individuals who have been pulled over for driving under the influence (DUI) or driving while impaired by alcohol (DWI), been arrested and charged with DUI or DWI, stopped at a drinking and driving sobriety checkpoint, requested to submit to a breathalyzer, submitted to a breathalyzer test, or failed a field sobriety test given by a police officer. 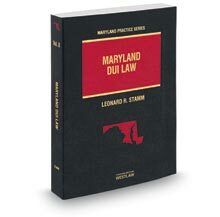 He is the author of Maryland DUI Law, the authoritative text on the law of drunk driving in Maryland. He is a former president of the Maryland Criminal Defense Attorneys' Association. He also the Dean of the National College for DUI Defense. (Click here to read and watch a video of his Dean's Address). He is rated "AV-Preeminent" by Martindale Hubbell, recognized as a Super Lawyer, and a Best Lawyer. He is also given a rating of "10-Superb" by Avvo. In Anne Arundel County, the Maryland State Police patrol Route 50 from the county line to the Chesapeake Bay Bridge. Anne Arundel County Police patrol Route 50 and other locations throughout the county. Annapolis also has its own police force that stop people frequenting the numerous restaurants and watering establishments in the downtown area and along the shore. Cases also arise out of the Maryland Live Casino, and County Police also patrol the Baltimore-Washington Parkway, which is under concurrent state and federal jurisdiction in Anne Arundel County, with the exception of the portion that crosses over land within Fort George G. Meade. Cases are heard either in the District Court Building on Rowe Boulevard in Annapolis or in Glen Burnie. The Circuit Court is located in downtown Annapolis, on Church Circle. Motor Vehicle Administration hearings are most typically held at the MVA on Harry Truman Boulevard, off of Riva Road. If the defense is successful and the court finds the defendant not guilty, all court and police records may be expunged. In court in Anne Arundel County, the typical sentence on a first offense where there is no accident or injuries, if found guilty, is probation before judgment. Offenders are usually placed on probation long enough to complete an alcohol education or treatment program and attend a MADD victim impact program (a one night meeting where offenders listen to drunk driving victims). Second offenders frequently serve a couple of weekends in jail. Unfortunately, most lawyers in Anne Arundel County assume the case is too difficult to win in court or at the MVA and fail to challenge the State's case. Some lawyers never challenge the State's case. This can be a huge mistake since most DUI cases have issues that can be raised in defense, and with zero or very minimal penalty. In other words, the result of fighting and losing is rarely worse than just pleading guilty or not requesting a hearing at the MVA. So why would you want to choose a lawyer who will not fight your case? When interviewing a lawyer, you should ask if your lawyer intends to fight the case, and if not, why not. If you need to be defended or represented in the Anne Arundel County courts and have been charged with a DUI or DWI, or any other traffic violations, call Leonard R. Stamm today to schedule a free consultation. Leonard R. Stamm also has extensive experience representing individuals charged with criminal offenses in the District Court and Circuit Court for Anne Arundel County. If you have been charged with possession of a controlled dangerous substance, possession of drug paraphernalia, assault, theft, malicious destruction of property, violation of probation, or any other criminal offense in Anne Arundel County, call 301-345-0122 today or click here for an online form to schedule a free consultation. We represent clients throughout Anne Arundel County, Maryland including: Annapolis MD, Annapolis Junction, Arnold, BWI Airport area, Gambrills, Glen Burnie, Hanover, Jessup MD, Laurel, Linthicum, Millersville, Crofton Maryland, Crownsville, Davidsonville Maryland, Deale, Edgewater, Odenton, Pasadena, Riva, Severn and Severna Park Maryland.